This one was contributed by John Ingraham, in response to our post about Ralph Lewin (see below). Heres a Ralph Lewin story you might not know. 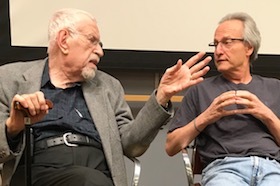 Ralph and Mike Doudoroff (another polymath: student of butterflies and snakes as well as microbial metabolism and taxonomy) were great friends. At the annual Asilomar meetings, Mike and Ralph always hung out together and interacted to everyone's delight and mild apprehension. On a Saturday of one of the meetings, which would run till Monday, with smiling Ralph beside him, Mike stood up and announced that he was a bit disappointed with the proceedings: Whereas speakers used to share enthusiastically their latest findings, now they only reported results that had been confirmed, reconfirmed, and accepted for publication. So to rekindle the spirit of the meetings old vitality, he and Ralph wanted to report on an experiment that was still under way. Why, they asked, didn't birds decimate the festoons of Monarchs that hung on the near-by butterfly trees? Do they taste bad? Are they toxic, possibly lethal? Ralph and Mike had just started their experiment during the afternoon break. Visiting the butterfly trees, they focused on two butterflies, one on top of the other. (long pause). Well, Ralph ate the male. Ralph reported that he tasted rather like hazel nuts and that he, Ralph, felt well. Mike promised that at least one of them would report on longer-term toxicity during the Sunday session, which they both did.